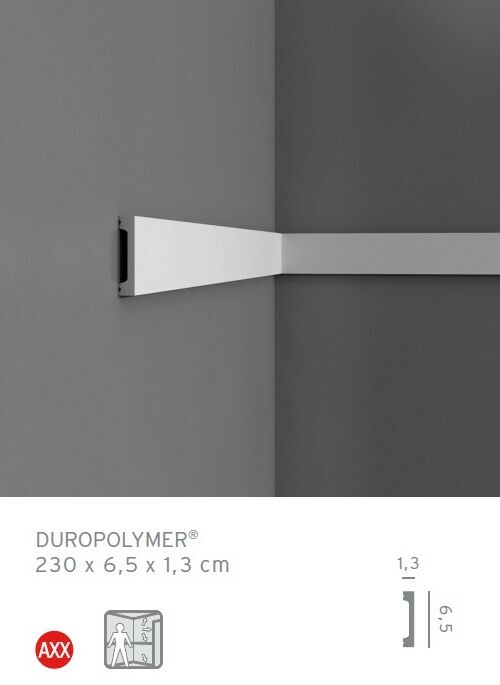 Stucco strip DX157 Orac Axxent with a wide range of applications can be installed as a cornice strip skirting board or a wall strip to break the boundary between the contrasting patterns on the same plane. Stucco is pre-coated with a primer paint, after the installation we recommend to paint stucco with acrylic or dispersion paints to an exclusive finish of the product. Stucco is resistant to moisture, washing or shock. The warranty on defects in material and technology for a period of one year provided following installation instructions and use of adhesives manufactured by ORAC DECOR. Material: DUROPOLIMER (extruded and impact-resistant).